High Point, NC – (March 8, 2018) – Spring Market introductions in the Hamilton-Wrenn Design District will showcase high-end furniture, accessories and home décor, along with numerous custom options for upholstery and case goods. Easily accessible by trolley or on foot, the Hamilton-Wrenn showrooms are a design destination for many market-goers. 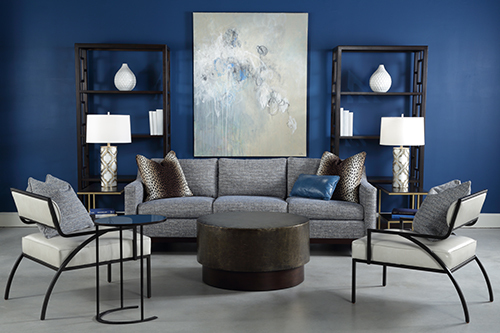 For April Market, new product introductions include furnishings for almost every room of the home, as well as customizable lines that allow retailers and designers to differentiate their store or studio portfolio. Dorya, an upscale upholstery and case goods manufacturer, is debuting the latest Vogue Living product introductions at 330 N. Hamilton during spring market, highlighting the intersection of fashion and furniture. At 129 S. Hamilton, the Christopher Guy showroom showcases the company’s latest introductions in a stunning 20,000 square foot state-of-the-art building, the first purpose-built showroom to be constructed at High Point Market since 2005. Additional destination showrooms in the Hamilton-Wrenn Design District include: Alden Parkes, Chelsea House, Fairfield Chair Co., Jonathan Charles, Leathercraft, Design NC, Stanley Furniture, Vietri and Wildwood Lamps & Accents Inc.
Alden Parkes will also once again host several CEU-accredited seminars at 200 N. Hamilton during Spring Market. Key topics include: 5 Color Mistakes You’re Making Right Now with Your Clients with Maria Killam; What’s Your Time Worth, Billy Ceglia; More Bang from Your Marketing Dollar, Beth Dotolo and Carolina Gentry; Design Transformation: Magic at the Table, Natalie Reddell and Danielle Rollins; Video Your Way to Success, Marina Case; and the Hamilton Highlights Tour with Natalie Reddell, Commander in Chic. A new signature event is also planned for Spring Market in the Hamilton-Wrenn Design District. Third Night: A Progressive Gala is Monday, April 16th from 4 to 7 p.m. Modeled after a progressive dinner, Third Night allows participants to travel from showroom to showroom to preview introductions and enjoy special “treats” at different locations. In the afternoon, complimentary bars offer beer, wine and networking on alternating floors at 200 N. Hamilton from 4 to 6 p.m. Cocktails are sponsored by IMC-DesignOnHPMkt.